Benchmark Mineral Intelligence expects graphite anode demand to increase seven times in the next decade as the EV revolution unfolds. Graphite anode demand could increase by seven times in the next decade, as the surge in electric car sales and the emergence of energy storage continues to drive the construction of lithium-ion battery megafactories. Currently, there are 70 lithium-ion megafactories being built with planned lithium-ion battery capacity in the pipeline of approximately 1,549Gwh, according to Benchmark Mineral Intelligence. While lithium, cobalt and nickel are key to cathodes in batteries, graphite is essential for anode production. According to the London-based firm, graphite anode demand is set to increase from 194,160 tonnes in 2017 to 1,080,360 tonnes by 2023 and 1,747,800 tonnes by 2028. “The US has zero graphite mining or processing capacity geared towards the lithium-ion battery industry,” Benchmark Mineral Intelligence Managing Director Simon Moores told the US Senate at a hearing on Tuesday (February 5). “The US does not have any active US flake graphite mines nor does it have any capacity to produce anode material from this feedstock,” he added. The most strategic US asset in the anode supply chain is German-owned synthetic-producer, SGL Carbon (ETR:SGL), which has a number of production sites and knowledge bases in Ohio, Pennsylvania, North Carolina and Washington state. For any investor following the sector it comes as no surprise that China is leading the way in the expanding electric vehicle industry. The country dominates both the mining and refining side of the flake graphite to anode supply chain. “The [Asian] country’s leading producers of anode material are leading China’s spherical graphite expansions to a cumulative 420,000 to 450,000 tonnes per year by 2020,” Moores said. But what is driving this move from top companies such as BTR New Energy, Shanshan Technology, and LuiMao Graphite? “This four-fold increase is a direct response to China’s soaring domestic EV demand,” Moores explained to the US Senate. China expects sales of 7 million new energy vehicles in the country by 2025, representing about 20 percent of the overall autos market there. 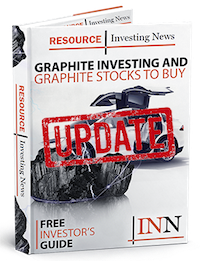 “Considering China’s position across the entire graphite to EV value chain, secure supply of anode material is as big a risk as cobalt for US to consider,” Moores said. Don’t forget to follow us @INN_Resource for real-time updates! Securities Disclosure: I, Priscila Barrera, hold no direct investment interest in any company mentioned in this article. Get the latest information about companies associated with Graphite Investing Delivered directly to your inbox.